Most of the cards being changed are Basic cards or cards from the Classic set. The start of a new Hearthstone season is always an exciting time. It looks like the beginning of the February season will be extra exciting, however. Why, you may ask? 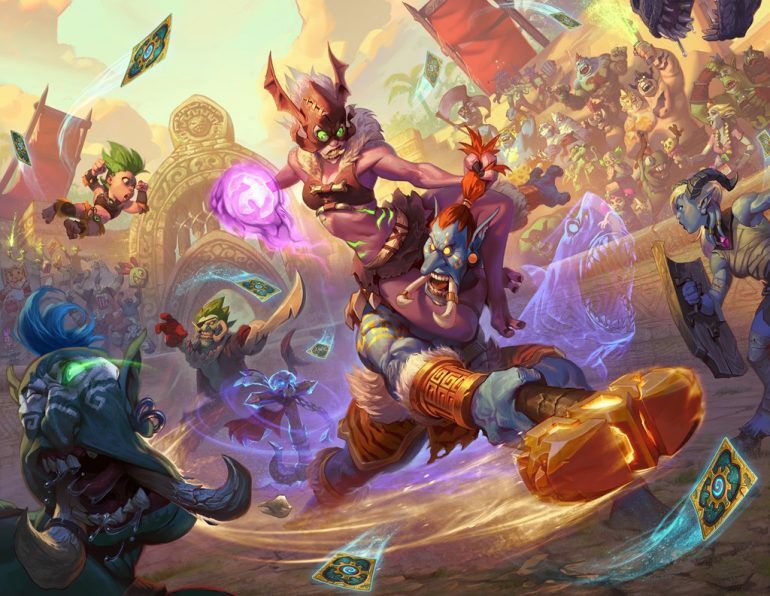 The Hearthstone team have announced a wave of balance changes that will take effect as of Feb. 5, less than a week into the new ranked season. Many of these changes could be in preparation for the new Standard rotation, which goes into effect in April. Even if this is the case, the changes will have a huge impact on the meta for the upcoming months as well. Most of the cards being changed are Basic cards or cards from the Classic set. In a post by the developers on the official forums, the team indicated many of the upcoming card changes are happening for the same reason. The general philosophy behind the update seems to be that Blizzard feels Hearthstone is a game that is most fun when strategies are constantly evolving. When new cards are released, devs like for older expansion decks to get a few interesting new pieces, but want you to be able to experiment with the totally new archetypes that emerge. Developers said when Basic and Classic cards become so broadly effective, they drive what deck styles are considered viable every expansion, making the goal of consistently evolving strategies difficult to achieve. Blizzard also stressed the importance of Basic and Classic cards and wanted to make clear that it understands the importance in the game these cards hold. The team say their intention is not to make these cards useless, but to give players more flexibility when building decks, as many of these cards are must-pick options. Classes with cards being changed include Rogue, Shaman, Paladin, and finally Hunter. Many players felt like Hunter should have been nerfed when the first round of balance changes for the expansion came out in December. While it’s unclear how these changes will affect Hunter’s success overall, they will undoubtedly slow most Hunter decks down. The changes to Lesser Emerald Spellstone will allow Control decks more time to set up and draw board clear when playing against Spell/Secret Hunter. 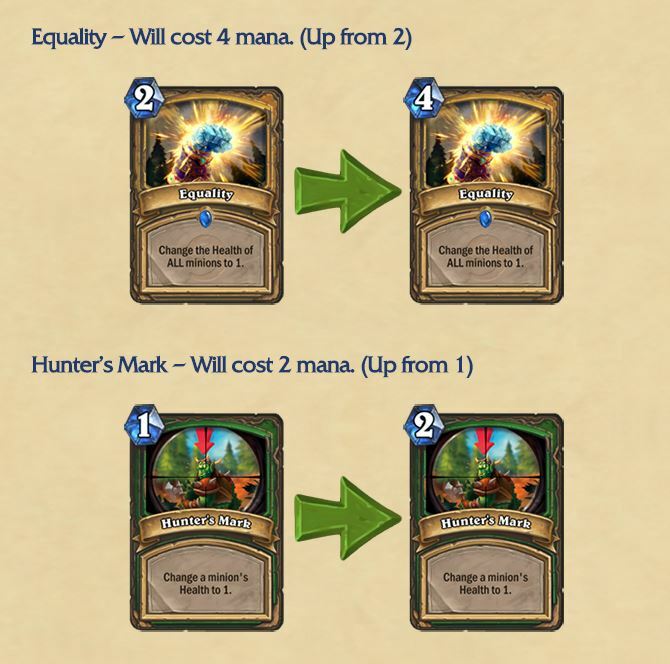 The Hunter’s Mark change will make it more difficult for Hunter players to deal with threats early game, giving other Aggro decks more breathing room against the class. 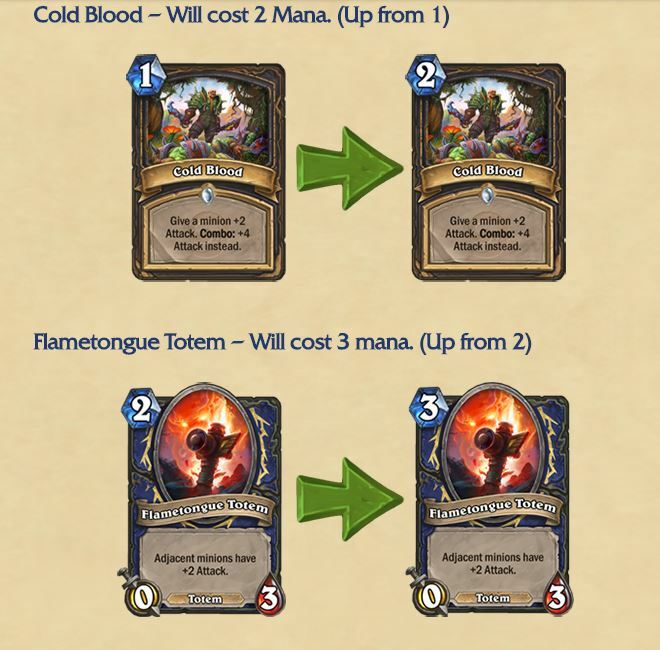 The most bizzare change seems to be the decision to make Flametongue Totem cost three mana instead of two. The only Shaman deck seeing great amounts of success on ladder for the past two months has been Even Shaman. This deck relies heavily on the use of Flametongue Totem and can only use even mana cost cards. Now that the Totem costs three, Even Shaman will no longer be able to run it, and will struggle to find early game damage as a result. It’s unclear how these changes really affect the meta, but players will probably be pleased to see Hunter finally see a nerf. Out of the 76 players competing at the HCT Winter Finals for the EU, 70 of them decided to bring a Hunter deck. It will be interesting to see how the play rate for Hunter varies once these changes are live on Feb. 5.